While summer is taking a slow start, our compost has been steaming up! This year from January until June we’ve processed over 1,600 lbs of organic waste from Saturday weekly drop offs. Now we’ve added additional open hours on Wednesdays from 5:30pm -8pm, during the Flatbush Farm Share CSA distribution. We take “garbage” that would have gone to a landfill and turn it into an amazing soil amendment for our gardens! We’ve been using our compost for all of our gardening and farming projects: growing Day Lilies and other flowers in our Pollinator Garden, herbs and veggies in the edible garden, and nurturing native species like Wild Ginger in our native plant garden. We can’t seem to make enough compost to keep up with growth, so keep your food scraps coming! We’ve also been keeping it sustainable by using repurposed materials for all our garden projects. Come check out the peppers and tomatoes growing beautifully in repurposed rice bags, with our own home grown soil. If you want to see the garden’s progress and get your hands dirty, you definitely want to come out this Saturday, June 23rd, for the BIG Garden Work Day! Join friends, neighbors and volunteers for a fun, educational, and interactive day. WHAT: BIG Community Garden Work Day! Bring us your food scraps during compost open hours Saturdays 11am – 1pm and Wednesdays 5:30 – 8pm. Remember to check out What To Compost. 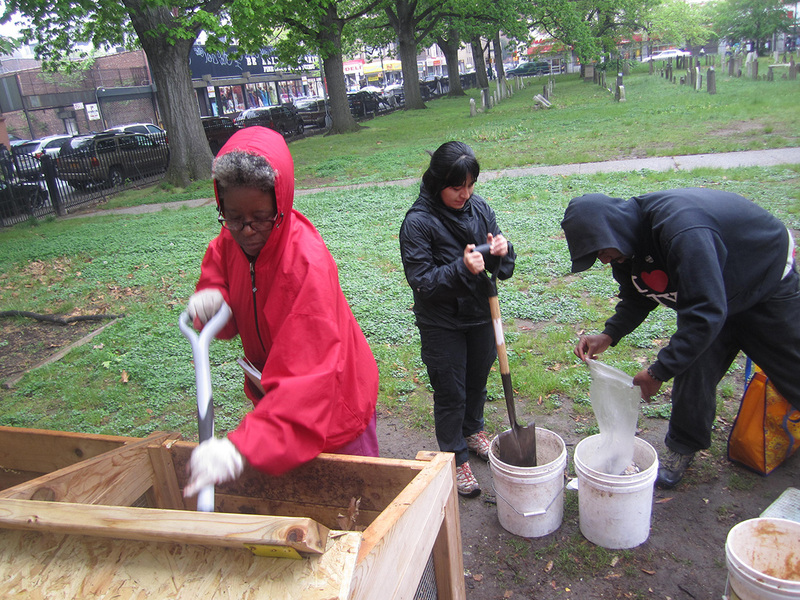 Contact kady (at) sustainableflatbush.org for more information or to join the compost team!